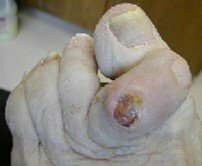 Hammertoes usually start out as mild deformities and get progressively worse over time. In the earlier stages, hammertoes are flexible and the symptoms can often be managed with non-invasive measures. But if left untreated, hammertoes can become more rigid and will not respond to non-surgical treatment. Because of the progressive nature of hammertoes, they should receive early attention. Hammertoes never get better without intervention. There are many different causes but commonly it is due to shoes or the way in which the foot works (functions) during walking. If the foot is too mobile and / or the tendons that control toe movement are over active, this causes increased pull on the toes which may result in deformity. In some instances, trauma (either direct injury or overuse from walking or sport) can predispose to hammertoes. Patients who have other conditions such as diabetes, rheumatoid arthritis and neuromuscular conditions are more likely to develop hammertoes. It is more common in women as they tend to wear tighter, narrower shoes with increased heel height. These shoes place a lot of pressure onto the joint and predispose to deformity. It is common for patients to wear shoes that are too small and this can predispose to the problem. In a study, we have performed, 95% of patients were in the wrong size shoes. Although hammertoes are readily apparent, to arrive at a diagnosis we will obtain a thorough history of your symptoms and examine your foot. During the physical examination, we may attempt to reproduce your symptoms by manipulating your foot and will study the contractures of the toes. In addition, we may take x-rays to determine the degree of the deformities and assess any changes that may have occurred. There is a variety of treatment options for hammertoe. 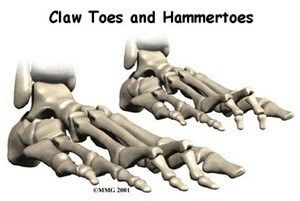 The treatment the clinicians at CPSM selects will depend upon the severity of your hammertoe and other factors. Often patients with hammertoe have bunions or other foot deformities corrected at the same time. In selecting the procedure or combination of procedures for your case, the clinicians at CPSM will take into consideration the extent of your deformity, the number of toes involved, your age, your activity level, and other factors. The length of the recovery period will vary, depending on the procedure or procedures performed.